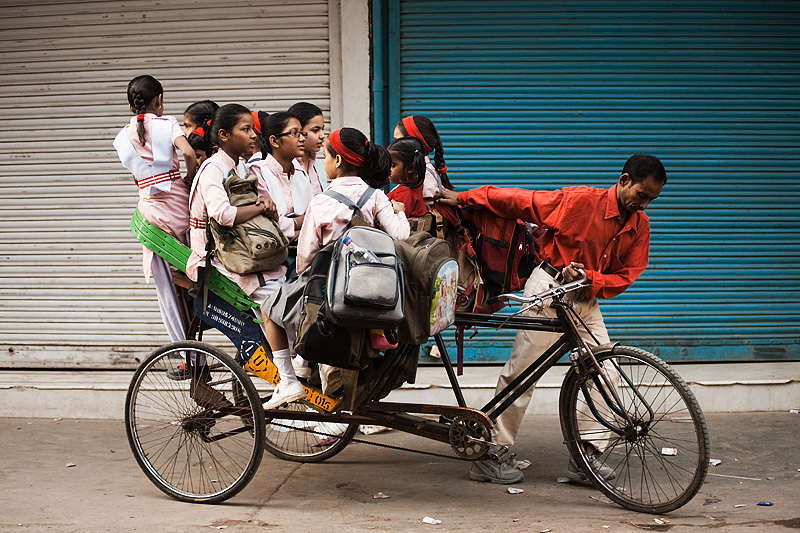 A gaggle of elementary school girls pile into a cycle rickshaw to get their learn on. In India, education up to a certain point is free (I believe up to middle school). Transportation to education is not. Wake up early enough in the morning and you see a potpourri of methods scraped together to move children to school, often employing techniques that circus clowns would envy. 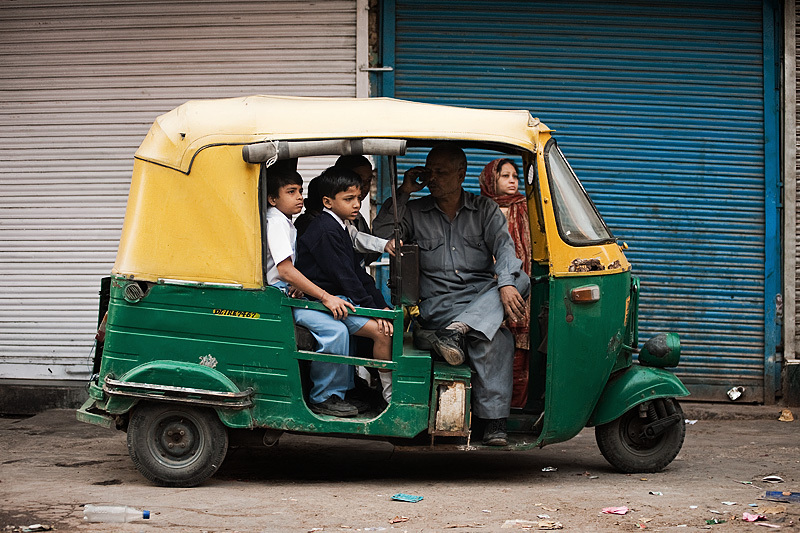 An auto rickshaw driver leisurely finishes a conversation as schoolboys await their ride. Time is not money in India. Locals frequently waste each other's time with apparent little concern. Traffic operates in a similar manner. Sure, why not make a 19 point u-turn in the middle of a busy alleyway? And please take your time because we all enjoy watching your mastery of a manual transmission. A van engorged with li'l chitlins awaits a tardy child to emerge from her house. 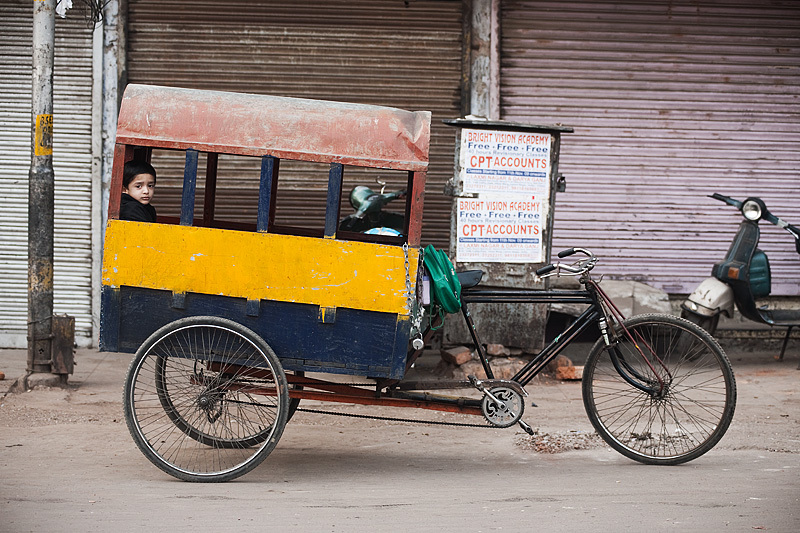 A lone pre-schooler in a modified cycle rickshaw. Notice the scrapes and structural damage on the top of this death trap. I'm thinking the rickshaw driver lost control a few times and sent the thing rolling like an errant Nascar vehicle. Luckily Indian children are resilient little buggers. Dust 'em off and their ready to go again. If you've read down this far and you didn't understand the 'short rickshaw' reference, you're probably one of my international viewers. In the US, special needs children often ride a modified, shorter version of a large yellow school bus. Nice series of photos! It seems India brings out the best in the photographer! My name is Daisuke Sakaguchi. I am a TV director of Japanese public broadcasting station, NHK. 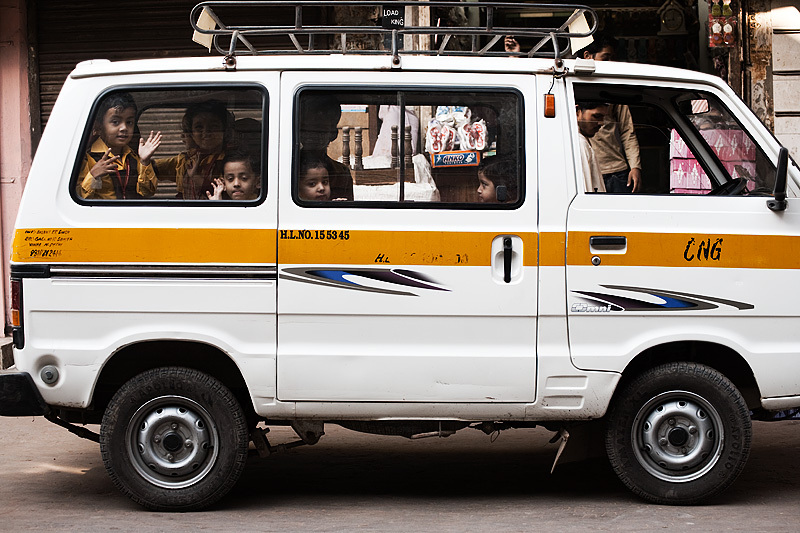 picture in which Indian children go to school on “The Short Rickshaw”. I found this picture very very impressive (and clear as well!)! Could you give me a permission for us to introduce this picture in our program? We will send you a DVD disc to show your picture is broadcasted in our program. Please let me know if we can use your picture as soon as possible. If you have any question, feel free to mail me.